As fiber links support higher speed network bandwidths with increasingly stringent requirements, it is becoming all the more important to ensure that your backbone links meet tightening loss standards. As network applications grow and expand, the need for higher data transmission capacity continues to grow as well. To guarantee reliable and efficient network connectivity and data transfer, the testing tool holds a key position in reducing the time spent identifying and locating the fiber loss. In this article, we will introduce an useful tool—visual fault locator (VFL) to achieve quicker, easier and more efficient fiber loss identification. VFL, also known as visual fault locator, serves as a fiber optic testing device that is widely used to locate the breakpoint, bending or cracking of the fiber glass. It can also locate the fault of OTDR dead zone and make fiber identification from one end to the other end. Designed with FC, SC and ST universal adapter, this fiber fault locator can be used without any other additional fiber adapters to locate fault up to 10 km in fiber cable. Featured by compact size, low weight and red laser output, the VFL is widely adopted to visually locate loss locations on fiber links and can also be employed to confirm fiber continuity. 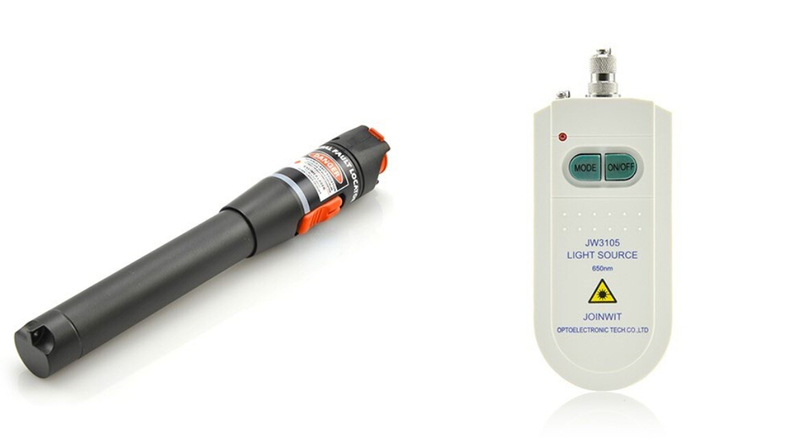 Generally, there exist two types of commonly used VFLs : pen shape visual fault locator and hand-held visual fault locator, the following picture shows the outlook of them. Since the light involved in transmitting signals over fiber optic is usually at 1300nm to 1650nm wavelength which is invisible to human, we can barely see it with our naked eyes. However, by injecting powerful visible light at 360nm to 670nm wavelength to the fiber, VFL helps to visually and directly locate the faults in fiber optic cable. This visible light keeps traveling along the core until it reaches a fault, then it leaks out, which can be seen through plastic coating and jackets. Thus, we can visually locate loss locations be it a macrobend, faulty connectors or a poor splice. In addition, VFL also helps to cover the range where optical time-domain reflectometers (OTDRs) are not useful because of the dead zone of the OTDR. VFL is an ideal tool for locating defects that occur at connection and around fiber cabinets which are hidden in an OTDR “blind-spot” or “dead-zone”. Fiber breaks, faulty connector, sharp bends, bad splices and similar faults can be visually located by VFL. Visual fault locator can boost productivity in the field by providing fast detection, precise fault location, distance, loss, and ORL measurements. Network environments sometimes are too complicated for technicians to find the fault location, which makes visual fault locator a vital and indispensable tool for fixing the problem timely and precisely. The VFL is also used for conducting continuous tests and performing fiber identification. With visual fault locator, you can easily isolate high losses and faults in optical fiber cables. Here we offer you step-by-step procedures on how to use a VFL. Step 1: Remove the plastic connector covers from both ends of the test fiber cable. Step 2: Connect the fiber optic visual fault locator to one end of the fiber. Press the tester button and observe that light emanates from the other end of the fiber. This gives a simple indication of the continuity of the fiber link. Step 3: Repeat with several other fibers. Check for light that can be seen leaking from a faulty splice. This may illustrate an easy way of carrying out visual fault finding on bad splices or joints. Step 4: Disconnect all equipment, put the plastic covers back on the connector ends and return everything to the state it was before you started the practical, so the next group can carry out the practical in full. What should be addressed is that during the testing process, you should never look into the output of VFL directly. After finishing the whole procedure, and remember to cover the VFL’s output with the dust cap. Visual fault locator provides us a simple and convenient way to quickly locate faults in fiber optic cable, which is proved to be time saving and economical as well. Besides, it also alleviates the problems and pressures when dealing with massive fiber optic cabling system. Hope this article would help you get a better understanding of visual fault locator. This entry was posted in Fiber Optic Testers, Fiber Optic Testers & Tools and tagged Optical testers, VFL, Visual Fault Locators on August 11, 2016 by Aria Zhu.